Laurent Wiesel, Founder and CEO of Justly, talks with us about leaving his BigLaw partnership to create a startup focused on litigation analytics. Wiesel discusses how he saw that there was a growing gap between what clients were asking on issues of pricing and process, and what law firms were able to deliver. Greg (@glambert) talks about his ability to post an actual written blog post this week about who is the customer. This three part series will examine the emerging trend for third party litigation funding. In this first segment, we describe what it is and why clients will find it interesting. Well, guys, this is the 8th year that I have launched the online portion of Fulbright’sLitigation Trends Campaign. Although it may appear to be just a simple download of a PDF, you really have no idea how much work goes into this. I reviewed Fulbright’s Litigation Trends Survey Report for Alternative Fee Arrangement (AFA) findings and came up with the following analysis. 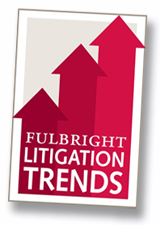 Fulbright’s released its annual Litigation Trends Report this morning. In its seventh year, the report has become a standard in BigLaw circles and has earned its share of kudos from companies around the country. So what’s the big story this year? Is a Texas Court's Requirement to File Exclusively Through LexisNexis a RICO Violation?